Blackjack Switch is a really fun and easy-to-play variation of blackjack, and you will definitely like it if you are a fan of splitting cards during a game: Blackjack Switch is impossible to play without splitting and playing two hands per round. The creator of this game is a British player Geoff Hall, and thanks to him such a method of blackjack cheating as switching stopped to be considered as ‘a sin’ and something illegal. You play two hands of cards and you are allowed to switch cards between these two hands in order to get the best card combination for winning. This is the most important question each player asks himself after his two hands were dealt, and it is not very easy to decide: to switch those cards or leave everything like it is at the moment. Sometimes it seems to be easy to form a good single card hand out of two dealt ones but there are a lot of cases a player loses when tries to do that; the blackjack strategy for switching cards is rather complex and impossible to simplify or describe briefly, though it exists of course and describes a player’s steps and decisions while having all possible variants of card combinations. Don't miss the chance to check your luck and play online blackjack at this website. 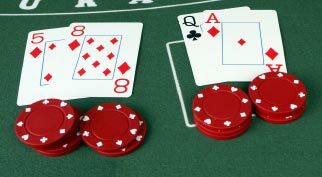 Today online casinos offer Blackjack Switch to play but be careful: the Internet version of this came has different rules than live casinos of Las Vegas for example; and the strategy of Blackjack Switch, which can be found in different books or web-sites on this topic, may work only for live casino games, not the Internet ones. Internet casinos reshuffle cards after every round, and this fact makes it impossible to beat online casino by using card counting.